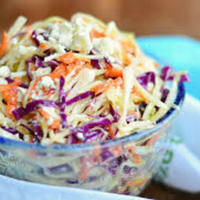 In a large bowl, combine the coleslaw mix, celery, onion, and parsley. In a small bowl, combine vinegar, oil, zest, salt, and black pepper. Add to cabbage mixture and toss well. Gently toss in blue cheese; set aside in refrigerator for 4 hours to chill. Serve with favorite burger or chicken.